In 1969, vocalist/guitarist Myles Goodwyn, guitarist David Henman, drummer Ritchie Henman and bassist Jimmy Henman, came together to form April Wine in Halifax, Nova Scotia. The success of their debut self-titled album and hit lead single, “Fast Train,” gave way to the sophomore release of ON RECORD, produced by the legendary Ralph Murphy. The album spawned April Wine’s first No. 1 Canadian hit, “You Could Have Been A Lady,” originally recorded by UK’s Hot Chocolate but which became hugely popular for the group and cracked the US Top 30 charts. Spurred by another cover single, Elton John’s “Bad Side of the Moon,” ON RECORD went on to achieve gold status but would be the last album recorded with the Henman brothers. Goodwyn and Jim Clench, who replaced Jim Henman on the previous album, forged on to continue April Wine’s success with the introduction of new members Jerry Mercer and Gary Moffet. Reinvented with an edgier, flashier look and sound, the group’s subsequent album ELECTRIC JEWELS showcased the writing talents of Goodwyn and Clench with hits such as “Weeping Widow” and “Lady Run, Lady Hide.” It was around this time when the newly formed April Wine embarked on their first national tour, The Electric Adventure, pioneering the use of pyrotechnics and lighting displays that revolutionized concert production. With a steadily growing fan base and rising success, it wasn’t until the release of STAND BACK (1975) that April Wine began their real rise to Canadian rock icon status. The album was the group’s first double-platinum achievement, with classics “Tonight is a Wonderful Time to Fall in Love,” and “Oowatanite.” In 1976, April Wine became the first Canadian band to achieve platinum advance sales for the album, THE WHOLE WORLD’S GOIN’ CRAZY, and the resulting tour was the first to gross one million dollars. Their next album, FOREVER FOR NOW (1977), also went platinum and marked another milestone for the band with their all-time best-selling Canadian single, “You Won’t Dance With Me.” That year the band further enhanced its instrumental prowess by adding third guitarist Brian Greenway, growing the foursome to five. It was also in 1977 when April Wine infamously posed as the ‘smoke screen’ for The Rolling Stones who decided to record LOVE YOU LIVE at the El Mocambo Club in Toronto. April Wine was billed as the headliner for a charity event with a group called ‘The Cockroaches’ – but of course, to the audience’s surprise and delight, The Cockroaches turned out to be The Rolling Stones. This show was captured for a live record, LIVE AT THE EL MOCAMBO, which became another platinum success for April Wine. The group went on to tour the U.S. with The Stones, and was also requested to join such heavyweights as Styx, Journey and Rush on their tours. The seventh studio album, FIRST GLANCE (1978) would prove to be the group’s turning point. The single, “Roller,” made April Wine an international success becoming their first gold record outside of Canada; and remained on Billboard’s Hot 100 Singles chart for 11 weeks, mirrored by the album’s 11-week stay Billboard’s 200 Album chart. April Wine followed up with HARDER…FASTER in the summer of 1979 – one of the group’s the hardest rock album ever recorded. The album included such powerful songs as “I Like To Rock” and “Say Hello” which went to the top of the charts in Canada. Both FIRST GLANCE and HARDER…FASTER went gold and platinum in the U.S., and reached double and triple platinum in Canada. International success continued to blossom during the ‘80s with the release of NATURE OF THE BEAST and lead single, “Just Between You and Me,” hitting Billboard’s Top 20, Billboard’s Album Rock Track and Billboard’s 200 Album charts. The single became April Wine’s biggest U.S. hit and skyrocketed the album to platinum status. On top of selling more than seven million records worldwide came countless accolades and awards. By 1983, April Wine had already won two Felix Awards and cumulated an astounding 11 JUNO Award nominations. Tour demand also hit fever pitch with the group performing throughout Canada, the U.S., England and Germany. Two more studio albums followed, POWER PLAY (1982) and ANIMAL GRACE (1984) which would be April Wine’s last album following the decision to part ways, but not without a final farewell tour. Eight years passed before fans would see April Wine together again on stage. In July of 1992, April Wine played to a sold-out audience in Manitoba, before hitting cities across Canada and the U.S. playing 80-100 shows a year. Their 13th studio album went gold, and given the success of the single “If You Believe In Me,” the band proved that they still had it. Over the next decade, April Wine continued to tour extensively and added a few more studio albums to their extraordinary catalogue of studio, live and compilation albums, DVDs and videos. Although the group has evolved over the years and band members changed, their music has remained distinctly April Wine. They have persevered and given fans rock ballads and anthems that will forever be etched in music history. 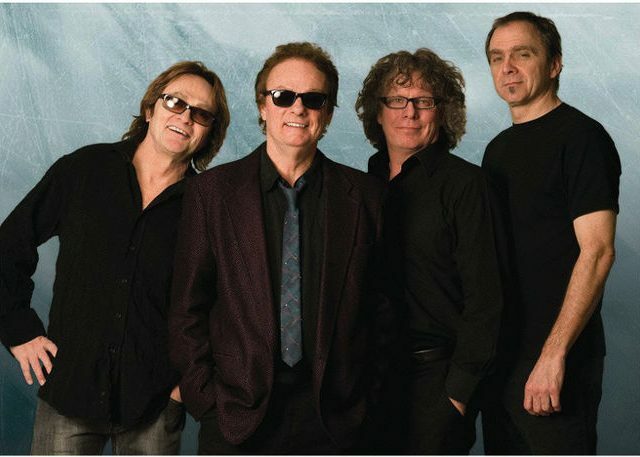 Most recently, April Wine received The Lifetime Achievement Award from the Canadian Music Industry Hall of Fame, and to this day continues to perform across North America.